State Department of Education officials say more than 48,000 children are enrolled in online schools to get their high school diplomas. It’s a choice families make for many reasons. Some students who excel in music, drama or sports need the flexibility of online education to work around the demands of practices and performances. Others are high achievers who are way ahead of their grade levels or have special needs. School officials say online classes provide students the ability to study at their own pace. One growing segment of the online school population are those students who were too afraid to go to school because of constant bullying. 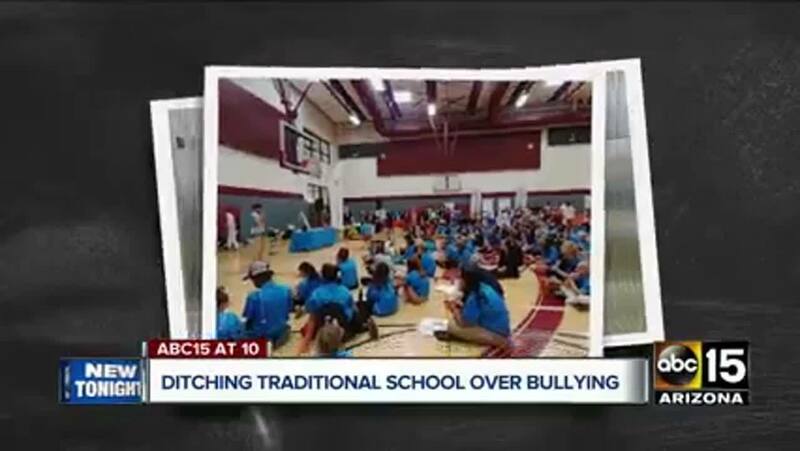 ABC15 spoke to families from all over Arizona, from Kingman, Prescott, Mesa and San Tan Valley, who said they made the tough decision to pull their children out of traditional schools because of bullying concerns they felt school officials did not appropriately mediate. “How am I supposed to tell my 7-year-old son, ‘You have to go to school to be bullied by these people? '” said one father who pulled all of his children out of traditional schools after getting fed up with the system. It’s a drastic move families felt they had to make because they want their children to feel safe. “We went to the principal several times about the bullying incidents and nothing was ever done,” said the father. “I used to cry basically every day going to school. It was just this deep-rooted feeling of never wanting to be there,” said 18-year-old Cy’anne Beasley, who now attends Arizona Virtual Academy. Beasley said her classmates teased her about her looks and her hair. “I’ve always been a bit different than the rest of the kids,” said Beasley. At Arizona Virtual Academy, Beasley said she was thriving, getting mostly As and some Bs. Beasley’s mother echoed the concerns other parents of bullied children voiced, saying school officials did nothing to stop the bullying even after several complaints. “They say they have a zero-tolerance policy, [so] why aren’t they enforcing that zero-tolerance policy?” said a father who asked not to be identified. January Queen, a San Tan Valley mother who made a similar choice, said it was heartbreaking to watch her child pretending to be sick or begging not to go to school. Her son, 12-year-old Aidan Queen, had Asperger’s syndrome, a high functioning form of autism. “I think people thought I was stupid,” said Queen. His mother said Aidan was teased for his long hair and found odd by other students. “He was being messed with to the point where he was hiding behind trees and buildings and reading just to get away from other people,” said Queen. Now at Arizona Virtual Academy, Aiden Queen said he was much happier and enjoyed attending class. He aspires to be a biochemist when he grows up. He was also involved in acting and enjoyed going to the online school learning center for activities with other students in similar situations. “I was bullied for my hair, my clothes, my boots that I wore,” said Boone. He was even stabbed in the hand with a pencil. In Prescott, ABC15 spoke to Hayden Harris, who is now an online student at Insight Academy of Arizona. Hayden said she didn’t want to go to school and had to call her mother to pick her up at lunchtime every day. Her mother said they decided to make the drastic move because she worried about her daughter’s safety. Colton, Aiden, Cy’anne, and Hayden are all part of the 48,000 students getting their high school diplomas online in Arizona. In 2009, there were about 29,000 students enrolled in online schools. Unlike homeschooling, online schools in Arizona have a set curriculum. There are standardized tests students have to pass, and students who are doing it now say it requires a lot of self-motivation and discipline. “Don’t open any other page on the Internet. Otherwise, you’ll never get back on to your school page,” said Beasley. A big question so many families asked before enrolling in online school was about their child’s social circle. Would their children have a social life? School officials said the answer was yes. Most schools organize dances and prom, along with field trips where students meet up beforehand and activities at learning center hubs in communities year round. Families of the students also indicated their children were involved in everything from sports to acting classes, science clubs and other social groups that kept them busy all day. While school is important, these families said their child’s safety was their top priority.